We got the bags!!! Do you guys remember back a week or so when I posted about my favorite Rabeanco bag for me and my mom as an entry into a contest? Well, I won those bags! This post is all about the bags. When I see my mom again in June, I'll add an update with the two of us posing with our prizes! So, let me tell you about my bag. I LOVE IT!!! 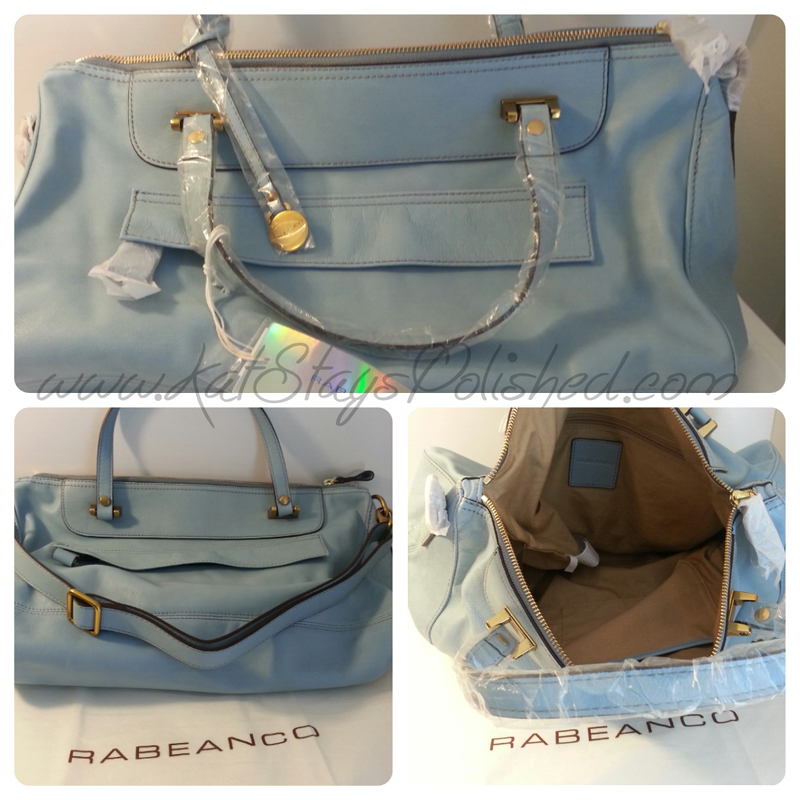 The sky blue color of the Bonham bag is just perfect for me and the size is just what I needed for all of my every day things! Are you one of those people who loves the smell of fresh paper, magazines, leather...? Things like that? I am! The fresh smell of good quality leather emanates from this bag and I can't get enough. I don't have a tote-sized bag at home that isn't something completely cheap. I wanted a bag that I could use everyday y to keep the things I may need during the day at work. I like to be prepared. 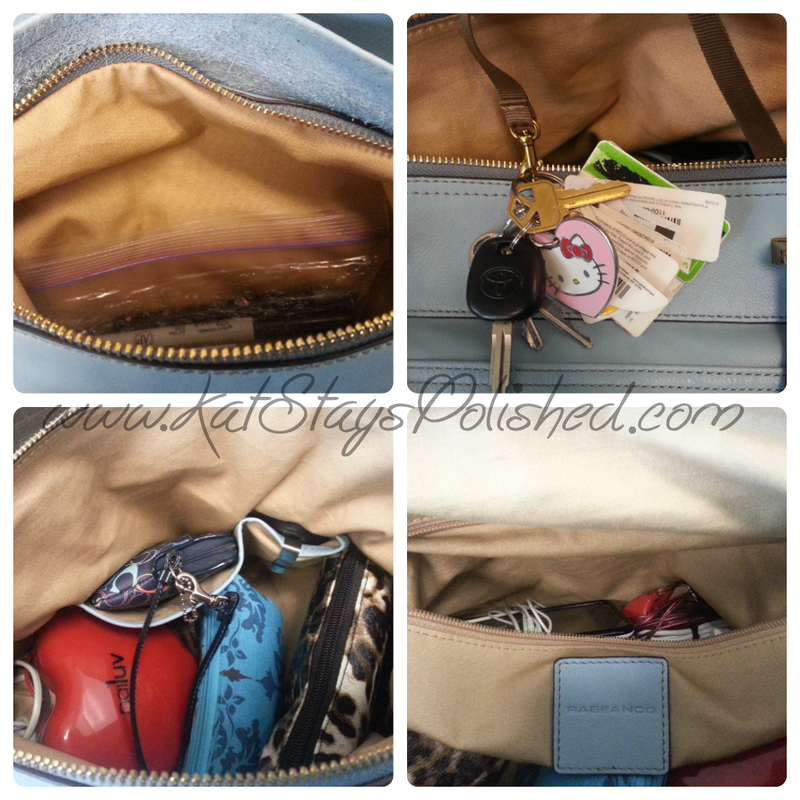 The bag has a zipper pocket on the outside, a zipper pocket on the inside, a wallet clasp attachment on the inside [that I use for my keys], a cell phone pocket, a slightly bigger pocket [that I use for my wallet], and a HUGE main area. I'm pretty sure I have something in every compartment. So now let me show you how I've arranged things in my bag. Normally I'd just throw everything in my purse but because I'm so afraid ruining the inside, I've put all my stuff into different bags. The animal print bag has medical-related things like headache medicine, bandaids, etc. 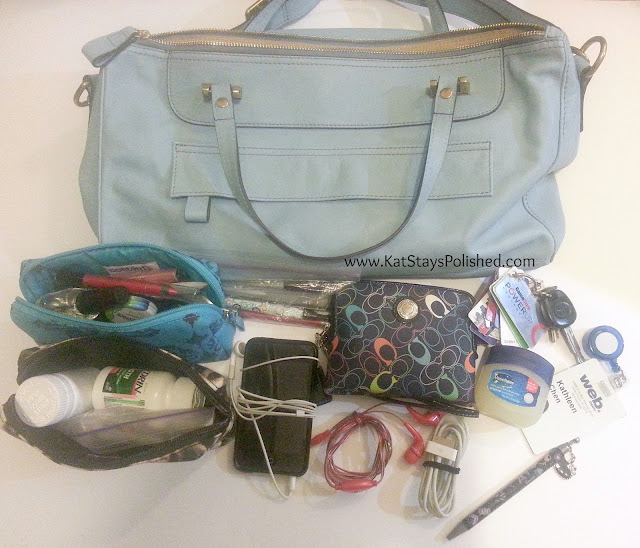 The blue bag has basic cosmetics and nail care items like lip gloss, cuticle oil, nail clippers, and my crystal nail file. As I said earlier, I have my keys attached to the little clasp inside. and my wallet tucked away in the bigger inside pocket. I have my iPod, charger, and Hello Kitty earphones tucked away in the inside zippered pocket. The only thing I have in the outside zipper pocket is a baggie full of pens. YES, in a bag because if one should leak and my bag gets ruined, I'd just die! With all this stuff, this bag feels kinda heavy, but I wear it up on my shoulder and that balances out the weight. There is an optional shoulder strap that the bag comes with, but I think I might opt out of using it. My arms and shoulder are small enough to fit through the regular handles of the bag. After all this stuff, I still have room for my iPad when I decide to tote it around and I could probably still fit a small netbook in my bag too. *side note: YES, I have [had] an LED cure lamp in my bag. I was going to do a friend's nails but ended up not. So, can you tell? I love this bag and I'm going to get so much use out of it. Ever since I had the opportunity to become familiar with this brand, I have been so obsessed that I now have a small wishlist going. The first item on my wishlist and that I totally love is Mara. Mara is a versatile clutch that can be worn many ways. I love the deep blue violet color and would love to add this to my collection one day. I would use this to go out on the weekends or simply running errands. No matter what I know it would come in handy. 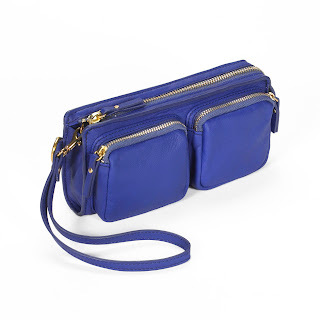 My second lust is the Julietta, and yes, in blue! 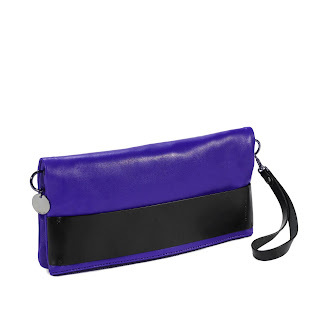 It's a wristlet that's also very versatile and can be worn with the shoulder strap or the wrist strap. I could find use for this the same way as the Mara clutch, but in this instance it would be especially useful for when I go to Disney or any other amusement park. It has compartments but is small enough to carry my essentials. Whew! I hope you've enjoyed looking into my bag and learning more about the RABEANCO company. For more information on these bags, or any other RABEANCO bag, visit their website or chat with them on Facebook or Twitter! 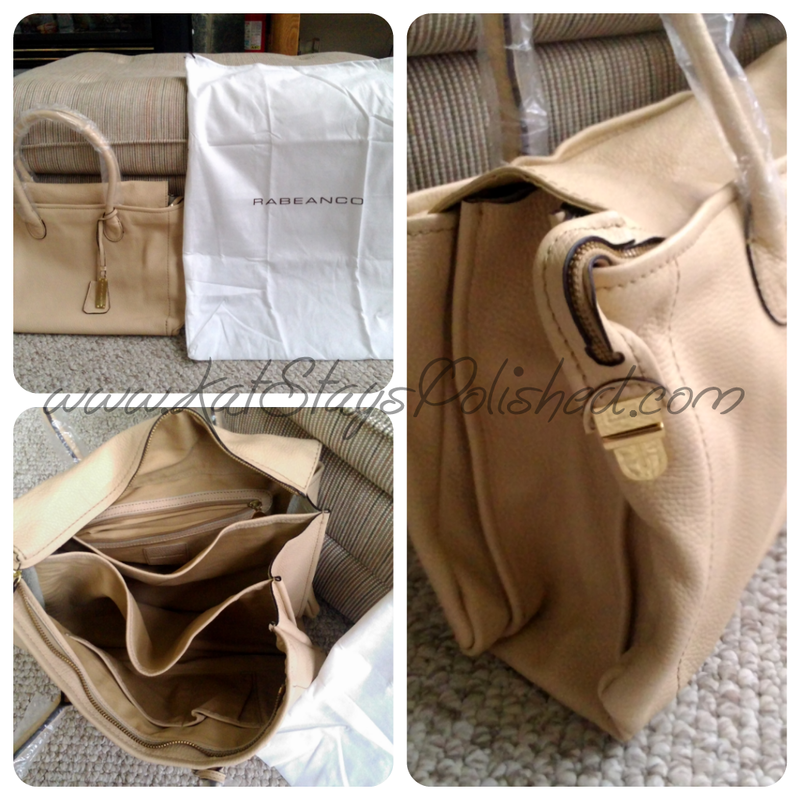 Lisa, I LOVE LOVE LOVE this bag. It's imply perfect for me and yea, the color is AWESOME!